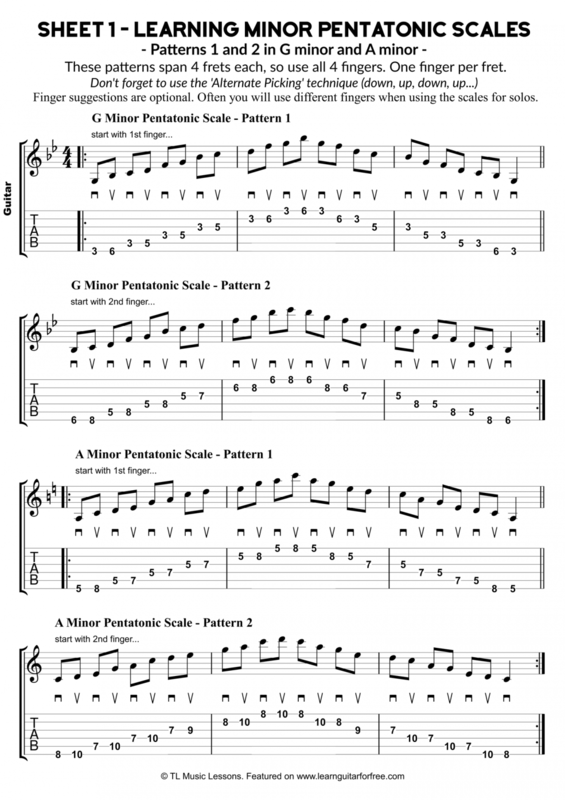 When learning the minor pentatonic scales (and most other scales too), it is important not to view them as boxes that you get stuck in when playing guitar solos. There are 5 shapes and the sooner you get used to linking them up and not lingering on one shape, the better. The scale shapes are a tool for navigating the guitar neck and it’s useful to start linking up the shapes so that you can move from one shape to another seamlessly. So, with this sheet, we are starting with Shape 1 and 2 in G minor and we hope to achieve the first goal of getting used to 2 scale shapes back to back and hopefully starting to remember the shapes as we move them both up 2 frets into the key of A minor. Repeat each exercise 2-4 times regularly until you are comfortable and fluent. You can revisit these exercises at any time – they will always be useful. Make sure to use 1 finger per fret, because each scale shape only spans 4 frets. That way you will play them quicker in the long run. Don’t waste time thinking you will be faster with 1 finger only because you will soon be faster using all 4 fingers after a bit of practice. Also, use the ‘alternate picking’ technique (down, up, down, up) as written. When you are comfortable, stick on a song in the given key and try playing the scales along. Then try improvising some melodies, or maybe some guitar solos if you are ready, using a combination of the 2 scale shapes. Try doing these along with some music. Use songs in the key of G minor for the first exercise (first 2 lines), and songs in the key of A minor for the second exercise (lines 3 and 4).